PRDC is holding its annual Our Turn To Serve Clinic on Friday, November 11th, to provide fee dental care to income-qualified Virginia veterans. Double Click on the image above or go to https://www.youtube.com/watch?v=ufn54cOAGgY for a video about the event. For more information, also please visit our event webpage by clicking here. 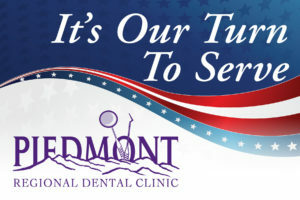 If you are a veteran and wish to be seen by our dentists on Veterans Day be sure to call (540)661-0008 and sign up today! Appointments are limited and going fast.